Pend Oreille County enjoys four seasons in this spectacular northeastern corner of Washington state. It’s an attractive year-round destination for people, birds and wildlife. Permanent residents include Great Blue Herons, Eagles, Hawks and shorebirds. Tundra swan migrate through the Valley, resting on Calispel Lake and the River to feed. Many different species of duck can be seen. Bald Eagles and Osprey have a strong presence on the Pend Oreille River as well. Mountains and miles of scenic coastline encourage a diverse bird and wildlife population, no matter what time of year you visit! At last count, there were 273 species of birds in Pend Oreille County. From waterfowl to loons, pelicans, herons, vultures, raptors, cranes, gulls, doves, owls, hummingbirds, woodpeckers, swallows, warblers, etc., your binoculars will be put to very good use! Click here for a printable list of all 273 species of birds found in Pend Oreille County, courtesy of Washington Birder. If you like to fish while you paddle, the Pend Oreille River will not disappoint. There are great opportunities and success stories along the 80 mile stretch of water. Targeting the sloughs in the southern portion of the river (Cusick to Newport), anglers can expect good size bass and occasionally some pike. Rainbow trout and walleye are also targeted. Northwest Fishing Reports – Search under Rivers for the Pend Oreille or under Lakes for upland fishing opportunities. 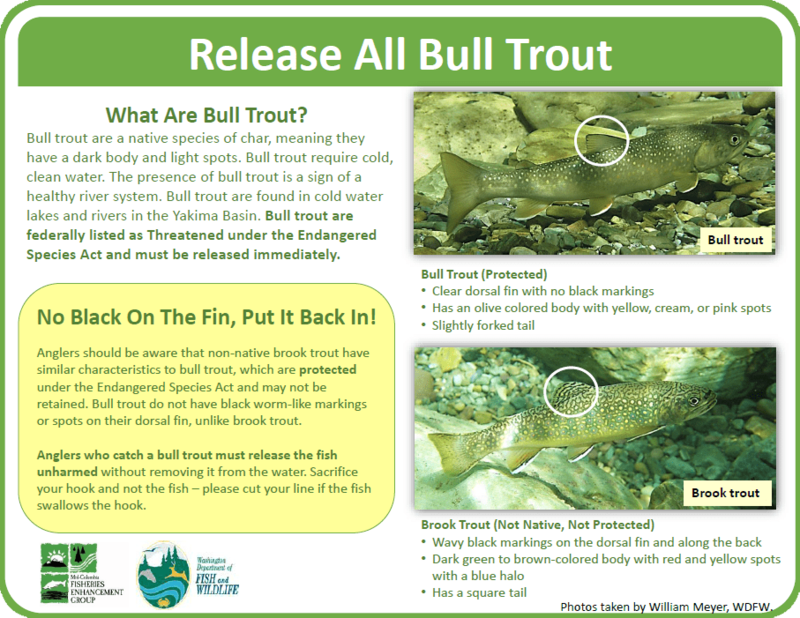 Caution: Bull trout (Salvelinus confluentus) are a Federally protected species and may be found in the Pend Oreille River and it’s tributaries. 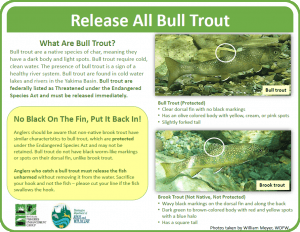 All Bull trout must be released unharmed.